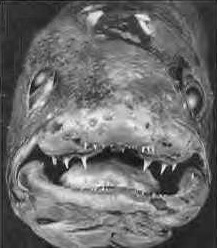 The coelacanth jaw possesses a unique hinged intercranial joint, allowing for an enlarged and very formidable bite. They are the only living animal with this structure. Predominately fish eaters, coelacanths subsist on lantern and cardinal fish, eels, skates, small sharks, squid, and octopus. Such creatures fall prey to its powerful jaws and are quickly swallowed whole. 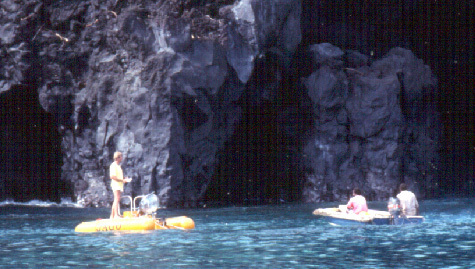 The Group Fricke submersible JAGO in front of a giant lava cave along the west coast of Grande Comore. 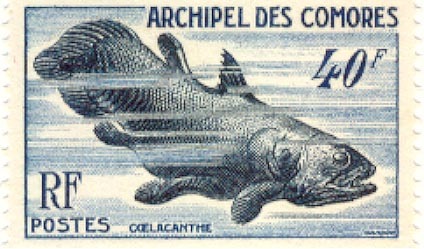 In 1954, the Comoros Islands issued the world's very first postage stamp depicting a coelacanth. 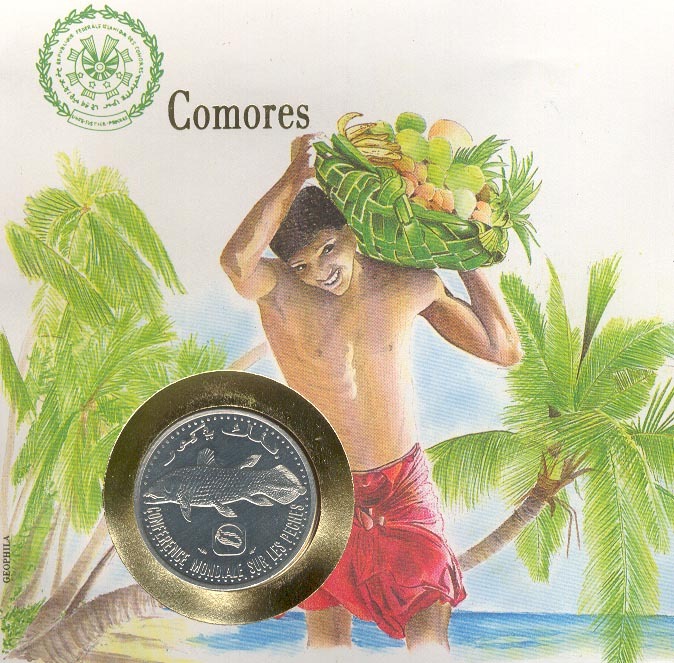 Subsequent issues and several denominations of Comorian currency also feature the treasured "gombessa". 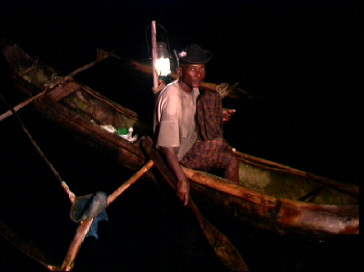 Lamparo night fishing in an outrigger canoe. The petrol lamp is used to attract fish to the surface. 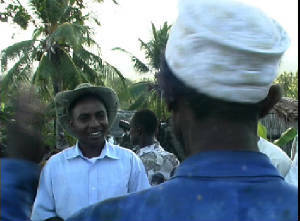 Said Ahamada of the APG greeting a village fisherman along Grande Comore. He was conducting canoe counts and interviews regarding coelacanth catches and fishing techniques. 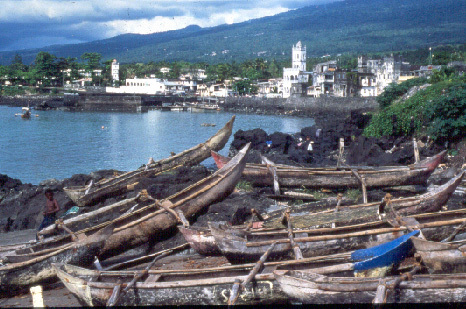 Traditional log hewn outrigger fishing canoes at Moroni, the Comoros capital. APG meeting with Professor Raphael Plante during the coelacanth park feasibility study. 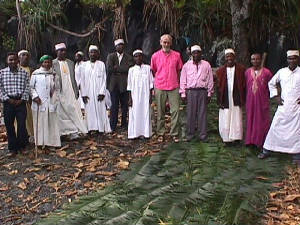 Central area of the future coelacanth park at Grande Comore. 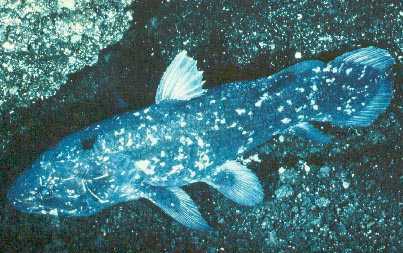 Coelacanths have been individually identified by their characteristic spots. This is Schwarzpunkt (Black-dot), Individual #12, which was first photographed at Grand Comore by Group Fricke in 1989 and was still living in the same locality in 2000. 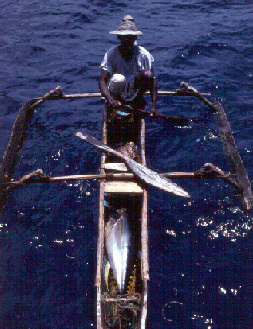 A Comorian fisherman using traditional methods to catch tuna. Offshore fish aggregating devices help increase catches of desirable fish. 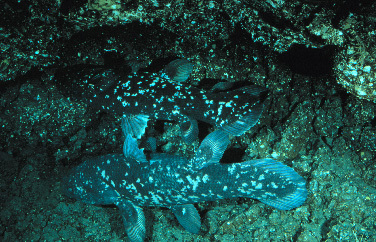 A well known pair of coelacanths in a lava cave along the southwest coast of Grande Comore. 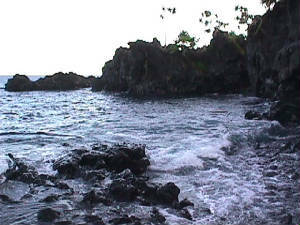 Note that the coelacanth's unique coloration blends in with it's volcanic surroundings. 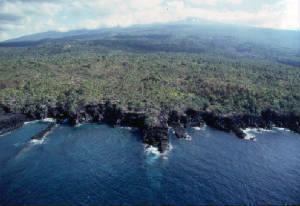 Lava shores leading up to Le Karthala, an active volcano at 2,360 meters, are a fascinating illustration of the Comoros Island's origins. 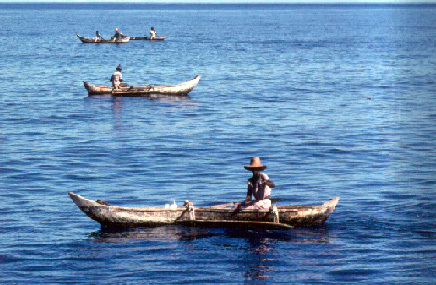 Comorian fisherman in their traditional "galawa" double outrigger canoes. 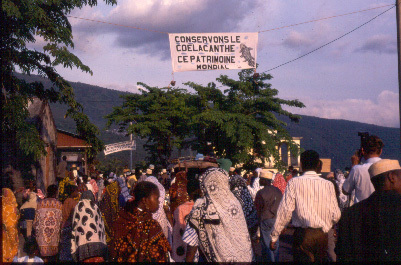 Celebrating the formation of the Association pour la Preservation du Gombessa (APG) at Dzahadjou, a fishing village along the southwest coast of Grande Comore, in 1995.